Katsura Grill in the Japan Pavilion at Epcot held its grand opening this morning. At the opening ceremony was Mickey and Minnie Mouse, Erin Youngs (Epcot vice president) and Hideaki Morooka (Isetan Mitsukoshi Holdings Ltd. general manager). Following the ribbon cutting everyone was welcomed into the gardens and new restaurant. Offerings included sushi, tempura and sake served in cedar cups. 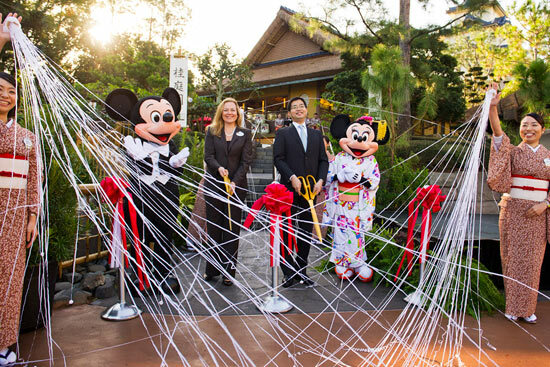 All sorts of dignitaries gathered early this morning to officially open Katsura Grill, including Mickey and Minnie; Erin Youngs, vice president of Epcot; and Hideaki Morooka, general manager International Business Operations for Isetan Mitsukoshi Holdings Ltd., partners with Disney in the Japan Pavilion. I am Sicilian and my husband is Japanese. What a great place this is! I am following you from Rome, Italy!